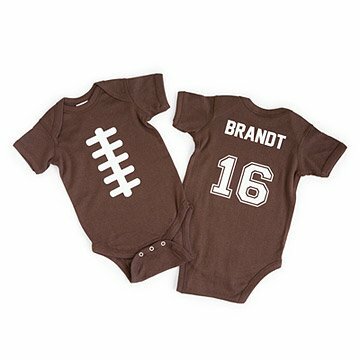 This football babysuit comes customized on the back with a name and jersey number. Gave it to relative who is pregnant with a little boy. She is ready for the Instagram photo with his sister wearing a Packers jersey, holding her little brother wearing the football onesie. She has to wait til he is born. My baby cousin is the 5th generation of his namesake. Everyone pretty much lost their minds when I added the last name and the number 5! It was the perfect gift. How cute is this?! Perfect gift for a football fan who is having his first baby boy! This onesie is a total touchdown!! This is such a great product, mostly because it can be personalized! I love the idea, and the baby's parents love it too! I bought this for my sisters firstborn. It is unbelievably cute and got rave reviews at the baby shower. This was so cute and sent quickly. Very pleased!! !